Recently I got the idea of replacing an ancient irrigation controller at my house. 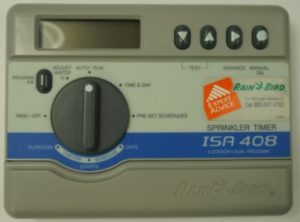 The existing irrigation controller was a Rainbird ISA408 (photograph at right) which dates from before the Internet happened. In today’s world of course we all have the idea that anything around the house, no matter what it is, should somehow be connected to the Internet or to our smart phone, or should in any event be very high-tech. Taken to its extreme we would have the Internet of Things. How might one go about selecting a new irrigation controller? In this article I talk about the new irrigation controller that most people choose these days, and what I think might be a better choice for some people. I surfed around and learned that the irrigation controller that just about everybody buys nowadays is from a company called Rachio. This controller does not really have a screen or keyboard. You drill holes in the wall, screw the controller to the wall, connect wires to the controller (for example wires to power and to zone valves) and then when this is all done, the instructions say to download an app to your phone and “create an account”. Which involves agreeing to some terms and conditions, of course. One of the selling points for this Rachio irrigation controller is that when you set it up, you tell them the address of your house. Before running an irrigation cycle, their system will look up the weather at your address in a pinpoint way with Weather Underground. If their server sees that it is raining at your address, then it will know not to run the sprinkler cycle that day. Likewise if it sees that the temperature at your address is close to freezing, then it will know not to run the sprinkler cycle that day. 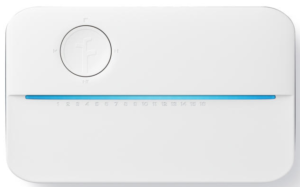 I see in the news that Rachio has struck deals with some municipal water systems that the water system will give a homeowner a rebate on their water bill if they swap out their old controller for a new one that saves water. 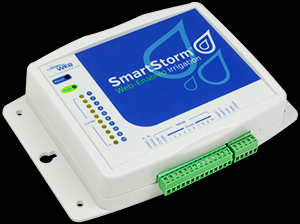 Another irrigation controller that I found is the SmartStorm. It costs about the same as the Rachio. This is the one that I eventually selected and installed at my home. At this point I returned to the technical specs of the SmartStorm controller. It has a built-in web server, which does not rely on a cloud server (as does the Rachio controller). Nothing about the SmartStorm controller requires you to share any personal information with anyone else. You never have to give any personal information to the company that makes the SmartStorm controller. But wait! What about the feature of avoiding running a cycle when it is raining, or when it is near freezing? It turns out that even before the Internet happened, there was a way to do that. 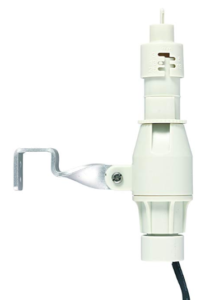 The way that you do it is that you purchase and install a $16 sensor like the one in the photograph. You mount this sensor somewhere outdoors and run a wire to the controller. It senses rain, and it senses the temperature, and it sends a signal to the controller to to tell it to skip a cycle if it is raining or if it is too cold. And yes you can get the same rebate from the water company if you install this sensor, rather than installing the Rachio controller. A few other questions come to mind. Suppose you purchase one of these Rachio controllers, and suppose you get to the part of the process where you are asked whether you agree to the terms and conditions. And suppose you decide that you are unwilling to agree. Can you then return the controller to the place of purchase and will they give you your money back? Will they pay somebody to fill the holes in the wall that you drilled to mount the controller to the wall? Have you recently upgraded your irrigation controller? How did you go about selecting your irrigation controller? Please post a comment below. I did so in 2016. Put in a sprinkler system where I didn’t have one before. Installer recommended and installed the Rachio device, complete with app on my phone. I went to Europe that summer and, the lovely person watching my house and mail for me let me know by WhatsApp (yes, my son made both her and me that trendy, modern and up to date) that it had been hot here in Fort Worth in July (go figure) and that the grass was looking a bit piqued. So, I turned on the sprinkler system to run. From Innsbruck, Austria. Then again from Bratislava, Prague and Berlin. By the time I got to Amsterdam, it had rained in FW, so it wouldn’t come on. I’m happy with it. That remote access seems cool and convenient. Haven’t noticed much in the way of ads being pushed to me that I can tie to Rachio. It seems to be fairly accurate about checking with the local weather tower (I was told it uses NOAA) and skipping for rain and freezing. I DID notice that my water bill went up about $ 75/month on average, but my yard looks far better than it did while I was having to move hose-on sprinkers around the yard when and if I got around to it. I too have owned a Rachio since 2016 and my experience has been pretty good, however it is far from perfect and does not really allow for the customization that I would prefer. I love the concept, but Rachio has not delivered, in my opinion. The Rachio will still run sometimes (infrequently) when rain is forecasted. I have to admit that I did not read the “fine print”. Perhaps that reflects negatively on my attorney skills, but I do not believe I have received any marketing activity on my email account due to the Rachio ad. A neighbor (also an attorney) responded to learning about that clause by saying “nice to get ads that have some relevance to me”. I think his response is “nuts” (to use the clinical term). BTW, the Rachio does work better if a sensor is used, in addition to the weather forecast. Second, you said “you do it is that you purchase and install a $16 sensor like the one in the photograph. You mount this sensor somewhere outdoors and run a wire to the controller. It senses rain, and it senses the temperature, and it sends a signal to the controller to to tell it to skip a cycle if it is raining or if it is too cold.” But it does not sense when it is predicted to rain or not rain. I wonder whether you can program it to take instructions from some weather predictive service for anticipating needs, not relying upon present time weather conditions. 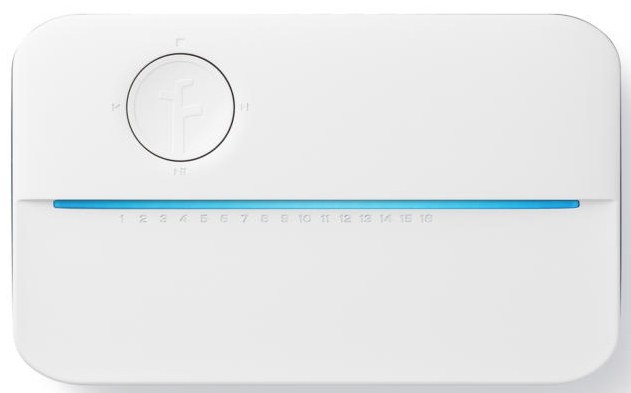 As for the nature of the IP connectivity, yes you are quite right that if a person has the time and the energy to do it, they can use a wifi client device to connect any wired ethernet device, including this SmartStorm irrigation controller, to a wifi network. This can certainly serve as a substitute for running a physical ethernet cable to the location where the SmartStorm controller is located. Another thing to consider is that by definition, if the SmartStream controller is functioning, it is because somebody already ran ordinary 100 volt AC power to the location. In which case another option is to use one of the ethernet-over-AC-power solutions. The bandwidth needs of the SmartStorm controller are so modest that any of these solutions is more than adequate to support fully the web-based interface. Turning to your second point. I guess you are telling me the Rachio system can make a decision to forgo an irrigation cycle based not only on present rain but also on predicted rain. I am not aware of any direct way to do this in an automatic way with the SmartStorm system. It would, however, be very easy to turn off an irrigation cycle by using a smart phone or desktop computer to visit the web-based user interface. It is also easy to set up (for example) a toggle switch somewhere which is connected by a wire to a control terminal on the controller, which causes the controller to take a particular action depending upon the position of the switch. One of the choices for configuration of the controller is that such an input will forgo any watering while the switch is closed.